FREE ACCESS TO THE CAMINITO DEL REY HAS NOW CEASED . If there are no availabilities for the day you want then an alternative is to stay at the hotel Posada del Conde and the staff there can arrange a permit for you for any day apart from Monday. In the new page select the date that you would like the permit for. (use the buttons to navigate through the calendar) – The red dates are days where there are no spaces left. Green dates have spaces available. Say how many people that are going with you and fill out the details of those people. (You will need their passport details as well. Note: Try to get all your info right the first time. Sometimes when the page refreshes and you have got something wrong, the information you previously put is lost and you have to start again. IMPORTANT! Remember that you have to be at the start point 30 minutes before your allotted time and from either end it takes around 30 minutes to get to the start point. Allow plenty of time to park your car and get to the start checkpoint to show your entry permit. Hello. Just tried to book for the beginning of May and both April and May are completely red on the website. Does that mean that everything is completely booked for both months? Should I try again later on this week? Do you think the status will be updated or that’s the final situation? If yes, is there another way to book? thanks for your answer. what would be the possibility to get in if i just go there in the morning. it’s only me, so maybe someone doesn’t show up and I can get in?!? How far in advance can you book. Looks like it is 60 days, but is this a sliding window or do both months open at the same time. So booking for June/July might both begin on May 1 for example. Can’t find any proper information around this and would like to know when to check back for July bookings. I have just spoken on the phone to the people running the reservation website… they say that the reservation system will open again today Friday 10th of April for booking the path in Jul, August and September… Keep checking the booking website because there will be another rush as soon as it opens. Dave. And “I” have never seen such a “crap” comment on my website before… You get it right… Go to the official website and just make a reservation like I and 50,000 other people have already done… Your lack of patience and education astounds me. If you have waited 10 years then a few more days or weeks don’t mean much… You can’t spell or express yourself properly so I guess it’s obvious to everybody why you can’t get a permit… Sure, go through the tunnels (you can’t get on the Caminito that way anyway) and pay the 6000 euro trespass fine when you get caught. Hi. I have already reserved and received confirmation email. But it make my confuse. Because the confirmation document only my name and passport no, but did not show my friend information. It is normal? How can I check the reservation detail. Actually, I try on website, but not successful. Would you give me some suggestion. I reserved on the date at 6-may. Actually, I did booking on end of March. Now booking is full. How can I do? We are hoping to visit the Kings Path, and have been trying to book, the web site just throws yoiu out, is anyone else experiencing this problem. How to we get to book if the site is not working ?? Any help please from anyone. We are in Furengirola from 29th April till May 20th. Intrigued to find the “system” that has now evolved if you turn up on the day (it was suggested to me it might be worth trying in case people had not turned up)) . Despite online tickets all booked up, you are advised to go to a nearby restaurant & “eat” there, whereby you can get a ticket. Alternatively, contact a guiding company & they can do you the same day. So – what quota do the restaurant & guiders get? Thanks for your comment Cazza. I Have written to the Malaga council to clarify this. I know that some local hotels and a couple of guiding companies can arrange permits but the restaurants is news to me. If this is correct then it makes a mockery of the online booking system. I’ll let you know when I get an answer. By the way, did you actually get a permit after eating at one of the local bars? We inform you that we are only concerned about the online reservation system. El Caminito del Rey is FULLY BOOKED until September (included). There are no more available tickets to be booked ONLINE. We know that some local tourist companies and public institutions such as Ayuntamiento de Álora and Ayuntamiento de Ardales are allowed to have some tickets a day but we cannot confirm you the exact number. So I replied with another question…………. And, this is the answer…. In these 500 tickets a day are included the ones for local businesses. Something definitely smells fishy and it’s really hard to get clear and concise answers…. On your recommendation I have booked us in for two nights at la posada del Conde. Is there any way to make sure we can get tickets to the Camino as it’s this Friday/Saturday when we are staying and I’m afraid tickets will be selling like hot cakes!!! Hi Camila, I am sure you will enjoy your stay and have a great time on the Caminito. We are on our way to Malaga and then Ardales now, so fingers crossed by the time we get there they still have permits. Or I’ll be quite sad! Let me know how you get on! I am staying there on the 3rd of July and will be annoyed if they didnt get the permit for you as they have told me many times that they can do this without a problem…. can anybody hook me up with a ticket or tell me how to get one through hotel eg.? I would like to walk Caminito on any of days 20/07 – 25/07. Hi there Chris…. If you stay at this hotel http://www.caminodelrey.es/posada-del-conde/ The staff can arrange a permit for you. Hi Janne, I am afraid we are all playing a waiting game untill the Malaga town council announces who will be running the Caminito del Rey from October this year. I booked some tickets for family next week but i have just found out that they are not going to make it. Do you know if i need to cancel the tickets? Sept booking just came up on computer. FULLY BOOKED. 900 people a day == 27000 booked before it shows up on computer. HOW??? Not sure what you are asking? The booking system at the official website hasn’t, as yet, opened up the reservation systen for the Caminito del Rey for the months of October, November or December… The Caminito website allows 700 permits each day when it does… The other 200 permits are given by the local councils of Alora and Ardales (100 each). September is full because when the reservations for July, August and September opened (in June) the demand was so great all permissions were pretty much full in a matter of days…. Hi! How can I contact these two councils of these departments? Thank you! We were extremely fortunate to go on this walk in May after a lot of persistence with the website. It looked as if it was fully booked but then 2 days appeared with just a few available spaces – I assumed that these were cancellations so hoped that others might have appeared to help friends and visitors wanting to do the walk. I enquired and was told that there are no waiting lists. I am now wondering if the facility for showing availability following cancellations has been withdrawn? I would urge people not able to take up appointments to follow the simple procedures for cancelling. I suspect that many just can´t be bothered as they haven´t paid. I think that some form of sanction should be applied to those who fail to give a valid reason within a time frame of say seven days. I have just read the information which says local hotels can arrange permits – this would appear to be an abuse of the system and I am going to complain directly to Malaga council. Corruption again!!!! I just can´t afford to go and stay in a hotel to go on a free walk – outrageous!!! You could also eat at the Los Caballos restaurant in Alora. Their website shows 10 euros per person for lunch or dinner and the price includes and entry permit for the Caminito del Rey… It also says on their website that you must eat in the restaurant on the same day that you walk the camino…..
Any idea when October bookings will become available? Well, legitimate or not, they are advertising this on their website…. http://www.restauranteloscaballos.com/gastroaventura/ … I for one do not agree with this but it is the way it is…. Right now the official system for reservations on the Caminito del Rey is closed for the months of October, November and December and we are almost halfway through September….. The only way to get a “free” permit is to stay in a local hotel or eat in a local restaurant….. A sad state of affairs really…. Dates for October November and December are now on the website. Only from the north end, and not weekends. Unfortunately it’s too late for me. I’ve already booked my flight home from a walking holiday. I have just returned from Andalucia where I managed to hike El Caminito. The only real way to book your place is through one of the hotels in El Chorro or maybe some of the restaurants. They require at least 3 days to make the booking. Using the website just shows that everything is full 3 months in advance. As for the actual Caminito, it has been well made and i think they have the numbers more or less right. I didn’t feel it to overcrowded, though the large occasional group going through made for minor spurts of overtaking. They have left the old path in places and its great to compare what it must have been like to walk it prior to the upgrade. Having done THE world’s most dangerous hike in China on the slopes of Hua Shan, i can assure all hikers that El Caminito once deserved that accolade but know it’s a pleasant hike through a dramatic canyon. It would be nice to see more ‘climbers’ at work on some of the slabs near the suspension bridge. So despite the suspicious racket surrounding the booking, the unfinished parking and general messy amenities at El Chorro, I would recommend this hike. Is there any way I can register for a cancellation? Hi Joe, you should have received an email from the caminito del rey with your permit attached…. Why not reply to that email? Ik had graag tickets voor caminito del rey,tussen 7/11/15 en 12/11/15,maar kan niet boeken via de site.Is er een andere mogelijkheid? Verblijf in het Garganta hotel of de Posada del Conde. Zij zullen de vergunningen te krijgen voor je …..
Stay in the Garganta hotel or the Posada del Conde. They will get the permits for you…..
the tickets for january were put out earlier this week,you should hurry and book,they disappear quickly! Hi! I see that you know a few things about the booking system to caminito del rey..Maybe you can help me.. We are a family of eight people who plan on going on the 2 nd of january,, I emailed the caminito website earlier to check when they put out new tickets for january,and got the answer december… So i checked daily,and saw the other day that available tickets were online. Then the problem starts,because you can only book for 5 people at the time.. So we booked for the first 4,and were supposed to book for the rest of the family,but then it was full already,on the same day the tickets were put out.. I have tried to email the website,but get the answer that i have to book tickets on their website..but that is not possible when it s full. Do you have any suggestions? I tried to explain that we wanted to go as a family,but impossible to book tickets when only 5 tickets could be booked at one time. So now we have 4 tickets for the half of the family.. Glad for any suggestions,exept for eating at the local restaurant,i know that is an option to get tickets,but i dont think that is fair. Oh that is a problem I see… You could try contacting the town halls of Alora or Ardales as they also issue permits. The only other way is to book a meal for after your walk. I know but it seems it might be your only option. I have been trying to book tickets for March since January. The website shows booking available for the following 8 weeks but curiously it is always fully booked. I contacted the official website . They told me it is fully booked for March. So if March was not available to book on the official website, how can it be fully booked. There is obviously another method of booking. I have read online that most of the tickets that are allocated daily are given to nearby Hotels and Restaurants. It seems that they specify that if you stay with them or spend a minimum amount in the restaurant that you will be allocated a ticket. Bearing in mind that in theory these tickets are free, what the hell is going on ! It seems a shame that such a wonderful amenity is yet again being abused so people can make a quick buck or euro. first of all, very informative website, thanks a lot! We are planning a trip to Andalucia in April and would really love to do the Caminito del Rey, therefore I am waiting to book hotels until I know if we actually can get tickets. Since it is apparently being privatized and will cost entry from April 1st there is no info or calendar on the official website. Do you have any idea where and when tickets from April 1st on can be bought? As you will be in the area my other websites might be of interest to you for your trip planning..
Hi, I would like to book four tickets for the caminito de rey for week starting 25 April 2016 but I’m unable to get booked on the official website. What I’m I doing wrong? Hi Gillian, you aren’t doing anything wrong. The booking portal is supposed to reopen today but I expect that there are some techies scracthing their heads right now with some teething issues. The portal should remain pretty much the same apart from the payment gateway that they will have to add so that people can buy the tickest instead of getting them for free. I believe the cost will now be €10 ……. my question is can we pay on-line with English debit card ? 1. Para visitar el Caminito del Rey será requisito obligatorio estar en posesión de la correspondiente entrada, que incluirá el día y la hora de la visita, además ésta es necesaria para poder salir del mismo. El acceso siempre será, salvo autorización, por la zona norte (por Ardales) al objeto de que el visitante siempre lo haga en descenso. Does it mean that you are only allowed to enter walk from one direction Ardales in the north? Can’nt you choose the direction fram El Churro? Please can you point me in the right direction for information for public transport from Fuengrola to the starting point of the Caminto del Ray? Do you know how long the journey takes? Hi Susan, I would suggest you pop in to the Fuengirola bus station as I heard that some companies were adding extra transport lines to get people from the coast up to the Caminito del Rey. Where can I find a good map over the “El Caminito del Rey”? I’ve been searching on the website, but those I’ve found is not very good and not so detailed. Hope you can give me a hint! Perhaps I can buy one at the entrance on the north side, where I’ve to start my walk? Hi Per, maps are quite hard to come by here still, especially up to date acurate ones…. Why not download google earth to your computer, find the area caminito del rey and print off the topo map? ok I will do what you suggested. When I’ll be back home after my visit in Spain, I’ll give you my views about the trip a s o. My start is on the 18th of May at 12.00 hours. Thats my 71 anniversity which I selebrate by walking “El Caminito del Rey” with three friends of mine. When you start the walk from the north side (Ardales), there are two restaurants that you can choose to park your car at, namely El Kiosko, and EL Mirador. Which of these is the closest to the entrance to the tunnel, which I understand is the shortest way to get through to the ticket check (about 20 min. walking)?? Return to the north side is done by bus. Where is the last stop? Is it at El Mirador or El Kiosko? In June I will go to the Caminito del Rey. I would like to know the direction of El Chorro is also possible to go over or just north / south direction? As far as I am aware you have to start at the reservoirs/el kiosko side and finish in El Chorro where you can get a bus back to the start point. 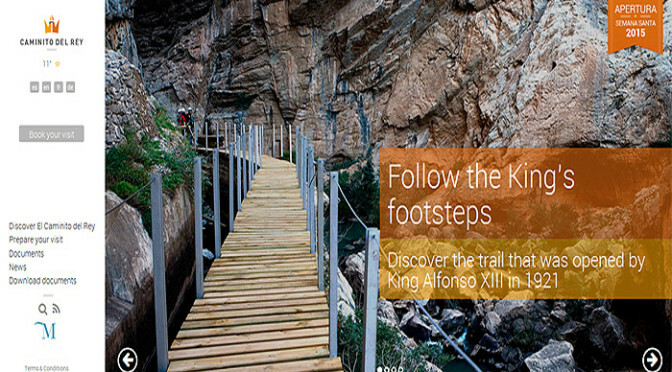 We’re going in June of El Caminito del Rey. El Chorro train to arrive. We want to know whether El Corro is starting to go on the route to the north or north / south? If you go to the north side when he comes to start the first bus after 10:50 El Chorro? The start point is the other end from El Chorro at the reservoirs/kings chair/elkisko restaraunt side. It depends what time your permit is for if you can get a bus to the start point? The new booking site has four calendar options. The too 2 are last minute (ultima hora). Click on the right hand top calendar and you should see last minute options for the current and next two days. It is no longer necessary to take your passport. All starts are from Ardales end. So either park at El Chorro by the station and get the bus to the start, or park at the Mirador or down by El Kiosko at the Ardales end and then you are close to the start but need to get the bus back. Your on line tickets are Euros 11.50 per person including the bus trip. They are quite strict about numbers on the pathway so do get there in good time. It takes 15-20 minutes to walk from. The Mirador. The bus from El Chorro takes 20 minutes and is often a bit late leaving as so many people are boarding. The buses seem to be going on the hour at the moment. You are not supposed to use selfie sticks but unfortunately a lot of people do. It’s a narrow walkway and its a pain to constantly wait whilst selfie stardom takes over from the beauty of the environment. Actually now there are 5 calendar options with the latest being changing for another date if the Caminito is closed for some reason on the date of your original booking. I am updating the info page about this now. Is this still valid in May 2016? Hi Per, No that is not valid anymore as it was from last year. The new rules are here.